Fragrance Friday - Nanette Lepore. When I wear Nanette Lepore, I sometimes think that I am a grown up Eloise. Now living at the Plaza, wearing chic, yet fun clothes, prancing around Central Park in May. With the sun shining, I think that I have bathed in this fragrance before dancing through the flowers. Eloise would have. Can you imagine? 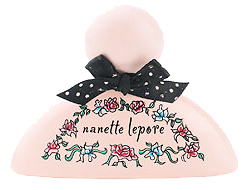 Then you can imagine this wonderfully romantic, yet fun and flirty fragrance, Nanette Lepore. The fragrance opens with moonstone rose, white peach, and white cranberry juices. With middle notes of black currant, orange jasmine, and Persian lime nectar, it is warm and sensual. The black currant smells so nice on me. As the scent dries down, I am left with the sweet smell of violet. Yes - light, springy, warm and sunny. With Gianni Mastrocola, master perfumer, Nanette's whimsical spirit is brought to life through the fragrance. Nanette Lepore Eau de Parfum Spray is available in both a 3.4 ($78) and 1.7 ($58) ounce size.